Perhaps one of the largest challenges when wrenching on modern cars is access to fasteners, as manufacturers trend toward smaller cars to improve fuel efficiency. As manufacturers try to cram more electronics into ever smaller engine bays, something has to give. Unfortunately for hobbyist mechanics, that something is most often space to work. Fortunately, mechanics are quite an adaptable group since they are usually problem solvers, which explains why obstruction wrenches were invented. Obstruction wrenches are wrenches that let you avoid various obstacles in your engine bay while still allowing you to gain access to a bolt or nut. While they come in several shapes, S-shaped obstruction wrenches are one of the more common varieties. 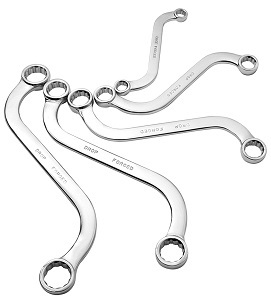 S-shaped obstruction wrenches typically come with boxed or open wrench heads, similar to the types you’d find on combination wrenches. The best S-shaped obstruction wrenches are well made, durable, and affordable. To help make your search easier, we have reviewed our favorite set in hopes of saving you some time! Sunex is a leading brand that offers complete sets of wrenches for pretty much any application you can imagine and they have a longstanding history of producing quality tools. Their 9940 SAE standard 5-piece set of S-shaped obstruction wrenches will cover most of the common fastener sizes used in automotive production which makes it very versatile regardless of what make and model your car is. Sunex also manufactures a metric set with part number 9940M to which all points in this review also pertain. The complete 5-piece sets are made from steel using a drop forging process, then polished give you a surface that’s quick to clean and durable for as long as you own the wrench. Both sets of wrenches are sold with a heavy-duty canvas pouch that has an internal pocket to keep the wrenches in the correct order. The bag also has a flip cover that will keep the wrenches clean and covered while they are awaiting their next call of duty. All wrenches are formed with a 12-point head on each end and each wrench has two different sized heads. SAE sizes are 5/16-inch x 3/8-inch, 7/16-inch x ½-inch, 9/16-inch x 19/32-inch, 5/8-inch x 11/16-inch, and 11/16-inch x 3/4-inch. Metric sizes include 10mm x 11mm, 12mm x 13mm, 14mm x 15mm, 16mm x 17mm and 18mm x 19mm. Each set of wrenches weighs around 2 pounds including the case and is small enough to fit in your slimmest tool drawers on your rolling tool chest or rolled up and placed on a shelf or in a cabinet. As far as available purchasing options, Amazon’s competitive pricing makes it the first place we’d suggest checking. Overall, Sunex makes one of the best S-shaped obstruction wrench sets on the market today and we give it a strong recommendation. We think you’ll be extremely pleased if you decide to pick up a set. Happy wrenching!